This blog post is all about how you can earn up to $2000 per month teaching a few hours from anywhere in the world (with WiFi). Sound appealing? Enter the details to download the full e-book guide! Let’s Get You Ready to Teach English Online! #Digitalnomad life is all the rage right now. I wanted to be a digital nomad before I ever heard the moniker. Having the freedom to live life on my own terms and go where I want when I want was always my ultimate goal. There are lots of different things you can do to become a digital nomad, such as start a profitable blog, sell a service, or create your own online business. Another lesser-known path to location independence is to teach English online. Is it the right path for you? If you think it is, I’ve created an e-book guide to help you get started! 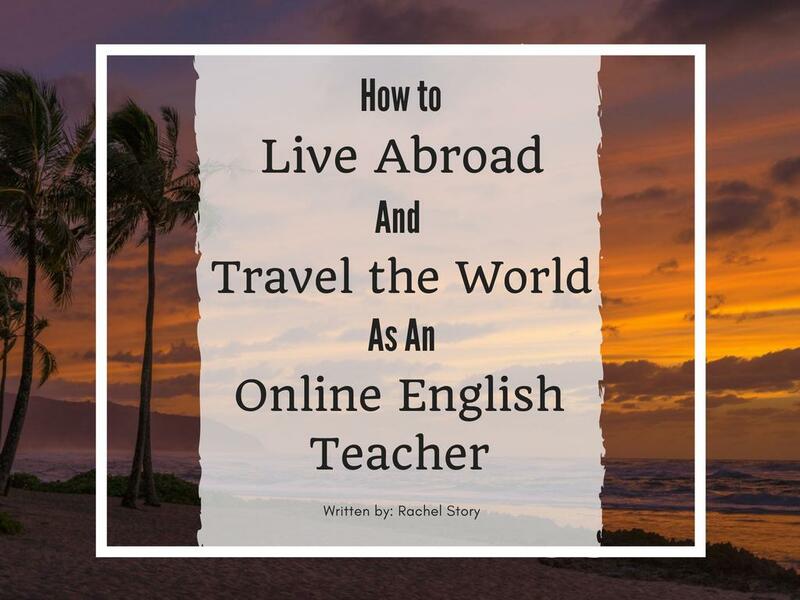 If you had told me 10 years ago that I was going to wind up living abroad and traveling the world as an online English teacher, I would’ve told you that you were crazy! Yet here I am, living in Puerto Vallarta, Mexico. Puerto Vallarta – our new (temporary) home. I thought I wanted to work in the music business as a tour manager or promoter. I tried really hard to make that happen, but we ended up needing food stamps just to get by. Then we made this big decision that finally set us on the right path. Man, have we come a long way since then. The road to get here hasn’t always been easy – and our journey has certainly had some bumps along the way – but we’re doing it! When we were teaching English in Beijing, I was incredibly busy. I always had more than one teaching job so I could earn enough to live and put a little aside for the few trips I got to take a year. In 2013, we finished up our contracts, moved out of our apartment, and went on a 14-month gap year around Southeast Asia, the USA, and parts of China. That feeling is the best feeling I’ve ever had! At that moment, I decided I was going to do whatever I could to make sure it never went away. Now my schedule looks like this: I teach English in the morning and then spend the afternoon working on this blog. At some point, I take a break to go to the gym and then cool off with a dip in my rooftop pool. July and August have extra teaching times since the kids are out of school, so I’m taking advantage of the extra income and teaching at night. The rest of the year I have my evenings all to myself. I usually spend them watching the incredible sunsets here, enjoying an amazing dinner, or checking out some live music. I can make my own schedule, so if there’s an event or social gathering I want to attend, I can rearrange my hours to fit my lifestyle. Sometimes I just need a beach day. Self-care days are important, too. The best part, though, is not having to ask a boss for permission to travel. I can live or travel wherever I want whenever I want, as long as there is fast, reliable WiFi. Remember that gif at the top? That’s also how I felt when I realized I had reached my goal of becoming location independent. Hoozah! We recently took our first stab at digital nomad life and spent 7 months traveling through South America all thanks to being able to teach English online. We did some pretty epic stuff on that trip such as ring in the new year in Valparaiso with some amazing fireworks, trek through gorgeous parks in Patagonia, party at Carnaval in Brazil, spend 4 days climbing and zip lining our way to Machu Picchu, and visit less-traveled areas of Peru on the Peru Hop bus. Being able to travel slowly and spend a full month in each city allowed us to dig beneath the surface and visit places only locals know about. It was a big learning experience and I think I have some pretty good advice to offer to others who want to do the same. In the past, you had to find your own students by marketing yourself and your qualifications. These days, there is an abundance of online teaching companies that do the searching and the marketing for you. This makes it easy to teach English online. You don’t have to have a degree in education or any classroom experience. Of course, these things will certainly help but they are not always required. If you have ever worked as a camp counselor, a swimming instructor, or even a babysitter, that can be counted as experience. It’s even possible to teach English online without a degree. Teaching English online allows you a very flexible schedule. You can work as little as 4 hours a day leaving a lot of time to explore new places or pursue your hobbies and/or other business ventures. It provides a financial safety net as well as the confidence to take that first step of getting on a plane knowing that you’re going to be able to feed yourself and pay your bills. Finally, it’s fun! We teach for VIPKID, so our students are kids. Sometimes my classes are frustrating, but for the most part, I can sing songs, play games, and act like a kid myself. It doesn’t even feel like work most days. Now that you know all the benefits of teaching online, you must be wondering how you can get started. You could do a quick Google search for online teaching companies, but there are so many. How do you know which ones are the best? What if you don’t have a degree or experience? Figuring out what you should do first can be a daunting task. Once you’ve landed a job, how do you transition to location independence or digital nomad life? I’ve created a guide that will answer all of these questions! It’s designed for anyone interested in teaching English online no matter your background or experience. One of the best things about e-books is that they save you a ton of time. I’ve done all the research and found the best companies so you don’t have to. This e-book is packed with actionable steps you can start taking right now to get you closer to living life on your terms. You can download it, put it on your phone, and refer back to it as you progress towards your goals. There’s no need to bookmark multiple websites with conflicting information! What are you waiting for?! Simply enter the information below to get started in just 5 minutes! I’m a Grateful Dead fan who saw them in Winterland in SF. I’m very interested in teaching English online and possibly moving to Mexico now that I’m 60. My concerns are my lack of a B. A ( I have an AA) And my age. What do you think? I’m super jealous! I’m sure that was an amazing experience. I’d love to hear all about it sometime! I don’t think your age is a problem but the lack of a Bachelor’s degree will make things difficult, at least with the companies based in China. The Chinese government made new rules this year saying that online English teachers need to meet the same requirements as teachers applying for a working visa in the country, which means they must have a BA. I think it’s a little over the top since these teachers are not actually teaching in China but that’s what they did. There is a tutoring platform called Cambly that you could apply to. They don’t require a BA. There are some other platforms where you just make a profile and the students choose their teacher. Some examples are italki, Preply, and Amazing Talker. I have my Bachelors Degree in Psychology. Can I be a teacher?? I have years of teaching experience. Absolutely! A Bachelors degree and any teaching experience is more than enough. Let me know if you have other questions ? Thanks for the great ebook. I have a question. I am a young and active 60 and my husband is 58. We have both completed our TEFL and want to teach online. Neither of us completed our degrees in Australia but we are wondering whether our age will be an issue with the companies you have suggested ? Hi, Amanda! Thanks for downloading the e-book! I’m glad you found it useful. I don’t think your age will be a problem in getting hired. There are quite a few retired and older teachers working for all the companies. Let me know if there’s any way I can help! I entered my name and e-mail address and confirmed my subscription, but I don’t see where I can download that free e-book. Hi Bart! After you confirmed your email address, you should have received an email with the subject line “[Download Inside]” plus the name of the e-book. In that email, there’s a button you can click as well as the e-book cover photo that will take you to the web version of the guide. In the top right-hand corner, there is a down arrow you can click on that will download the document to your computer. If you didn’t receive the email with the e-book, let me know and I can send it again. Thanks for your interest!